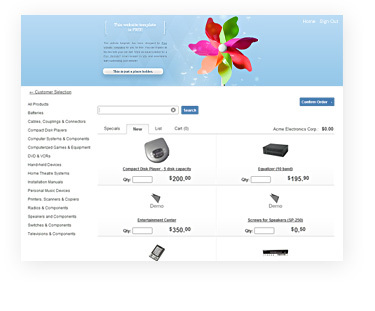 The WebStore allows customers, sales people, and defined guests to select from a catalogue of your companies products and place their orders online. 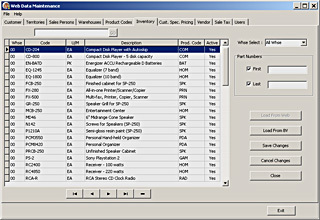 Search by name or product code. Sorting by code, name, and price. Connect a PayPal account so that customers can pay directly via PayPal or with a credit card even without a PayPal account. Tabbed item listings for specials and events. Secured using HTTPS -- the encrypted communication of the web. A logo, colours, a banner, backgrounds, product pictures, and a sub-domain of your choosing are all customizable to give your clients a familiar sense of your companies brand and image. 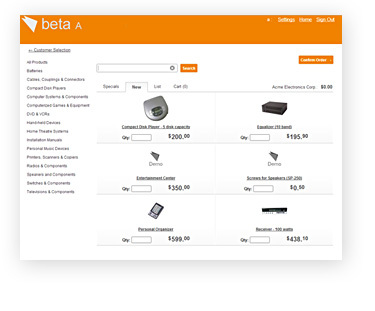 You control the creation of each WebStore user and what products, vendors, suppliers and client companies get shown.